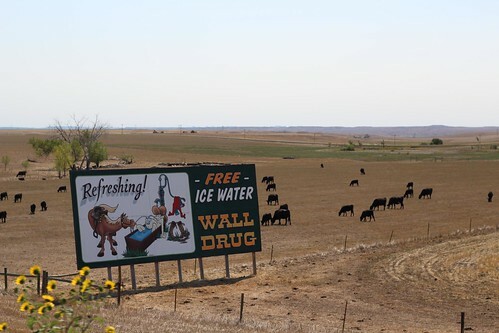 Mali Mish - Day 34: Wall Drug and Badlands National Park. Day 34: Wall Drug and Badlands National Park. Today was another day full of sight-seeing and driving. No relaxation for us. And how could we pretend that there was nothing to see today when we were reminded about our first destination… over and over and OVER again. Yup, good ol’ Wall Drug. Back in 1931, Ted and Dorothy Hustead invested all they had in a drug store, basically in the middle of nowhere. Times were tough for them, and for the rest of the country, too. But smarty pants Dorothy had a brilliant idea. She was going to advertise that they had free ice cold water on billboards up and down the highway. And guess what? It worked. All of the road trippers on their way to the newly opened Mount Rushmore started stopping by for free ice water and directions and eventually ice cream, too. With over 500 miles of billboards on the I-90 that currently costs an estimated $400,000 every year, this small drug store turned into a crazy huge drug store mall in no time at all. 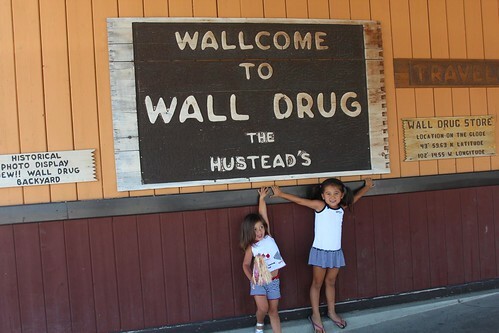 Wallcome to Wall Drug! 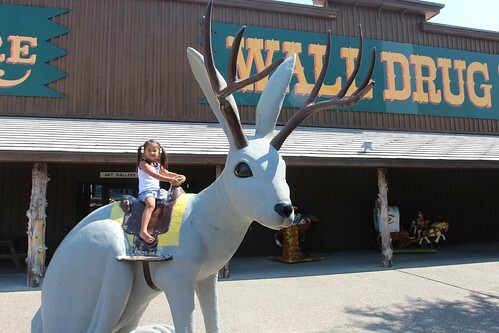 Over the years, they added tons of new features to Wall Drug. Like restaurants and even a chapel. 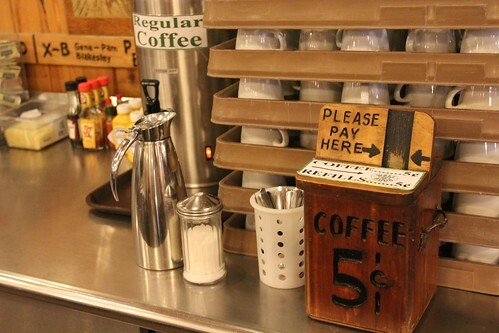 But the self-serve coffee still costs only 5 cents! 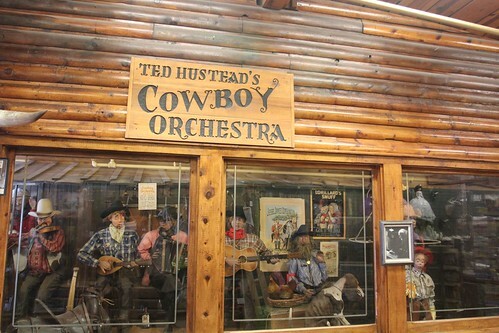 Wall Drug grew into a cowboy-themed mall. 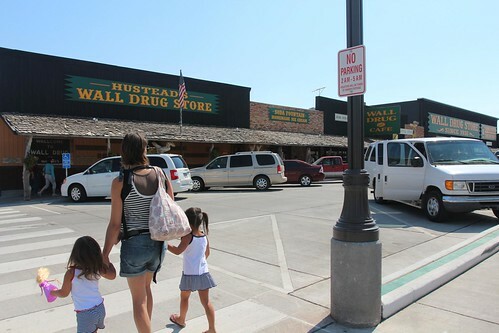 But it is different than the real mall because of the “stores” are owned by Wall Drug. I found the awesome little souvenir for myself. And don’t worry, I did not share “mommy’s juice” with that little hand in the bottom left corner in the picture. I actually threw her on top of this dangerous animal instead. Don’t worry the concrete ground is soft here in South Dakota. We made it through the entire place without the kids breaking anything valuable or themselves so a reward was in order. 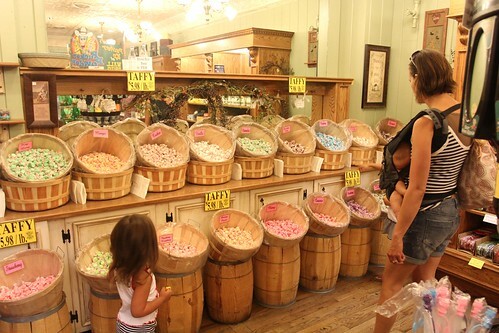 Mila has been obsessed with salt water taffy ever since Tiffany gave her some back in Denver. Thanks a lot, Tiffany! 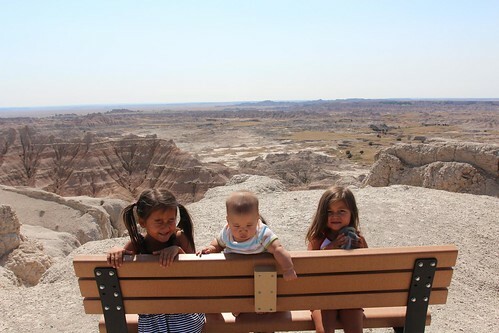 Our next stop was Badlands National Park. We are almost breaking even with the National Park Pass that we bought back in Bryce Canyon for $80. 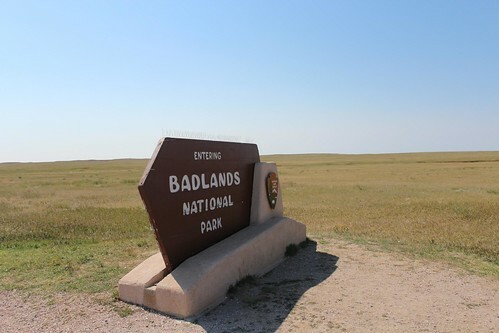 This is our sixth national park visit and Badlands would have cost us $15. It’s quite the site to see when you drive into the Badlands. To get there, you drive through lots of nice flat prairies and then… BAM! 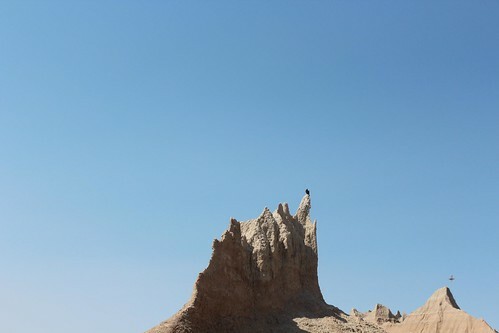 The Badlands show up and it sort of makes you cuss from the confusion of it all. 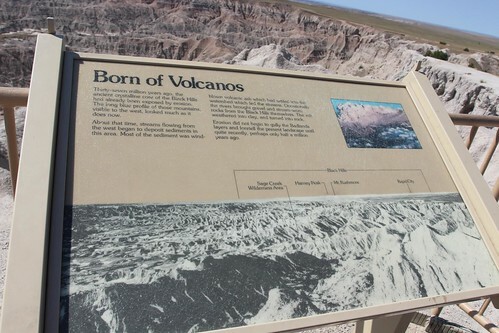 There are over 200,000 acres of wonderful eroded land that displayed wind-blown volcantic ash that settled here many moons ago. The kids weren’t too into it. More rocks. More dangerous cliffs that Mama is freaking out about. 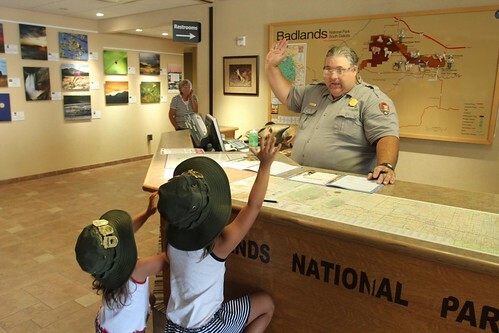 They just want to go the Visitor’s Center to get some badges and mess with the water fountains. But this visitor’s center is a bit different. 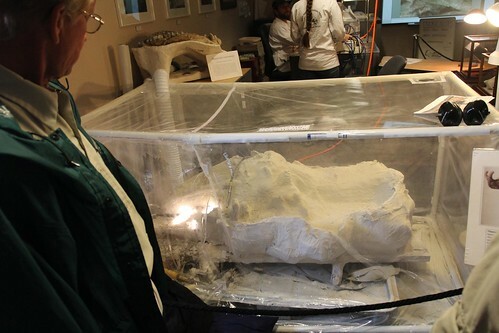 It actually had a fossil preparation lab in it. 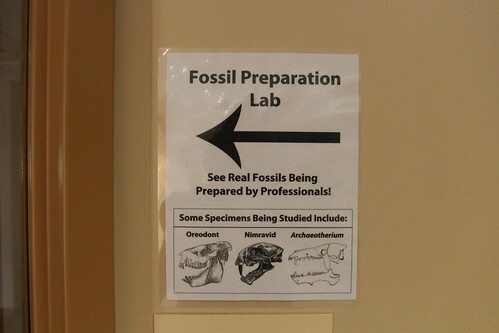 Ummm, real fossils, people! And look at that. A fossil. It was pretty cool. They were working on it as we were watching. I guess Badlands is known for being a fossil-rich area, especially for mammals. This is part of the blog post where Dan would have spewed some mumbo jumbo about intercontinental river convergence and how it relates to what we’ve seen in Utah. But that is not how I roll. Today we will oooh and ahhh over another bird I added to my life list. The GOLDEN EAGLE!! Oh man, it was awesome! I wasn’t expecting to see any animals really since we were driving through the park in the middle of the day. But there it was. Just sitting there. Waiting for his or her picture to be taken. It reminded of this day back on our 2010 trip when I spotted my first bald eagle. 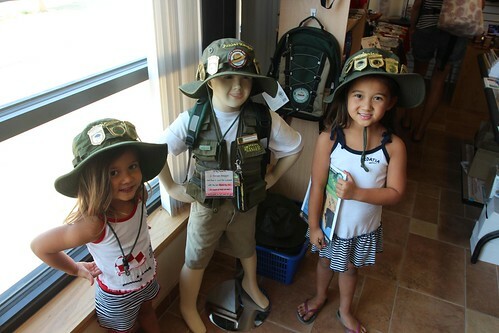 The girls were also excited to get their Junior Ranger badges for this park. Ava got a break from her homeschooling workbooks today by learning about the reintroduction of the black-footed ferret at Badlands, the most endangered land mammal in North America. And Mila was super into it this time. She’s got this thing down. They made a new friend during our field trip. Who says homeschooled kids are weird? This kid looks perfectly normal. I keep meaning to download the Roadside America app on my phone because I have a feeling we might be missing some quirky roadside attractions but today I didn’t need it. 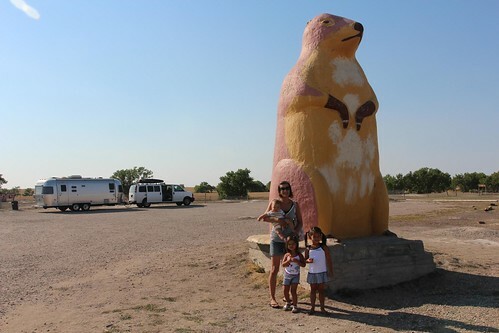 We somehow ended up visiting the largest prairie dog in the world! Woohoo!! The statue stands in front of the Badlands Ranch Store where we bought two bags of unsalted peanuts for the colony of prairie dogs that live there. 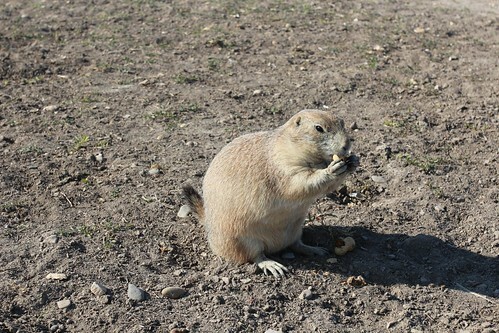 As soon as the girls opened the bags of peanuts, the prairie dogs came rushing over. It was quite the sight to see. The girls had fun and were not scared of these little guys or their obnoxious yelling. 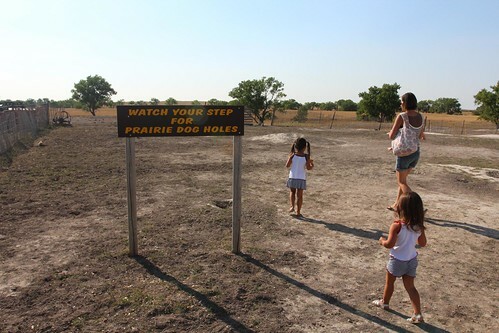 But that is probably because they couldn’t read the sign a few miles back that said “Don’t touch prairie dogs. They have the plague!”. The what?!?! Let’s get out of here! South Dakota, and Wyoming, has not been great for Dan’s workload. I don’t think Sprint remembers that these states even exist. But he just ordered a new set-up to help with issues like this in the future. 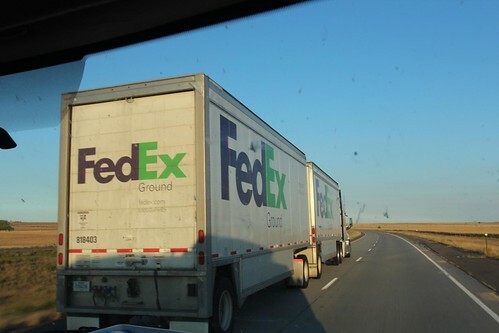 And he was so excited about it, that he swore it was in the Fed-Ex truck that passed us. What a dork. Alright, time to find another Cabella’s since the one last night treated us just right. 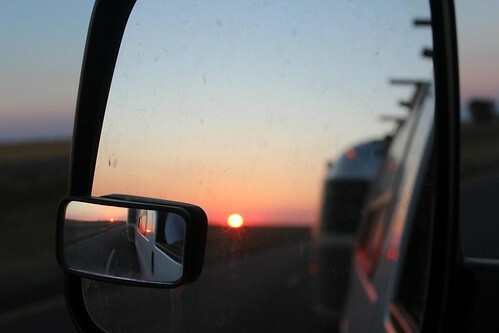 No bright lights like at Walmart and no diesel fumes like at truck stops. Day 33: Crazy Horse Monument and Mount Rushmore. Day 35: Little House on the Prairie in De Smet, South Dakota. 4 Responses to Day 34: Wall Drug and Badlands National Park. 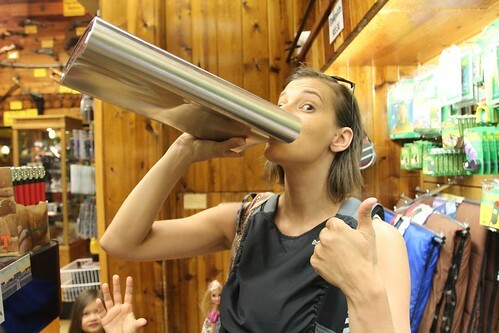 I am having a lot of fun following you through parts of the country that we’ve visited every year since our kids were little 🙂 Wall Drug is a classic…Love the kids with all their junior ranger stuff. What an experience you’re giving them! Wall Drug is etched into the memory of everyone that travels across South Dakota. 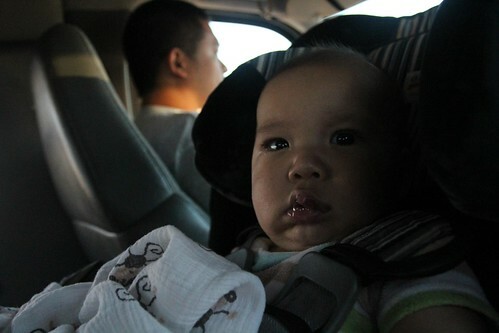 It helped me endure the boring drive. I still smile when I see a Wall Drug bumper sticker. I am glad you have a good internet connection. I look forward to your posts.